SALE ON THIS DOUBLE SUPER FEEDER PACK! Original CSF-3 Super Feeder serviceable for years to come, made in USA and sold by Super-Feed for over 23 years! All parts readily available and easy to replace if ever needed. Trigger both of them at same time! Adjust them individually from a tiny to larger portion up to 20 times per day. 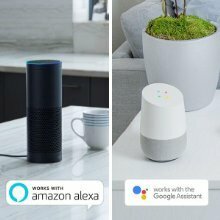 Some Wi-Fi/automation/voice command systems like Amazon Alexa®, and Google Assistant may also be used (Wi-Fi plugs not supplied in this combo). See example how Google works for a customer using voice activation. Save over two individual feeders! This very popular combo will help you train your pets to eat at their own feeder by triggering both feeders at the same exact time if they do not share one feeder very well. This double Super Feeder deal comes complete with two sturdy black ABS stands, one dual-outlet type digital timer (style may vary) to trigger both feeders at same time up to 20 times per day or certain days indefinitely, two Kibisan® dishwasher-safe black bowls especially designed to spread kibbles to the outer edge and away from the feeder's chute cover for better pet access., and two practically indestructible polycarbonate clear extensions. Each feeder holds 4 and 3/4 cups of dry food (about 1.5 lb.) and could be expended later with additional 2-cup clear extensions or the optional 1.5 gallon (24-cup) hopper. All hardware needed and instructions manual are included (even a video is available for minor assembly and operation). 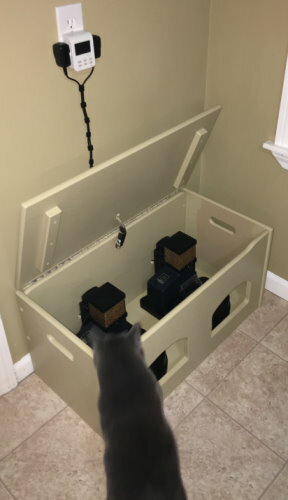 As an added bonus, each feeder includes a tough polycarbonate chute cover installed over the chute opening to help prevent intrusion by a "locksmith" cat! The feeders can be placed about 6' apart from a power outlet. Two digital timers or Wi-Fi plugs like the HS-100 TP-Link or WP1 socket could be used to place the feeders in separate areas. Voltage required: Power supply (supplied) 110-240VAC 50-60Hz 12VDC output, all timers 120V 60Hz--no batteries used. *USING A NAME BRAND LIKE "SCIENCE DIET" IS ONLY A BRAND EXAMPLE. Every morning silence and peace! Every morning as soon as we get up, our cat start yelling like a siren. Now with Super feeders, peace and quiet! Why did I choose Super Feeder because my cat can not get food from it when she wants. I used a different automatic feeders, she could easily open them or take out the food with her paw. My husband and I love Super Feeders, smart design, awesome engineer job and what I love the most, I can adjust feeder as I want! Thank you so much for well made, awesome product!!! I set these feeders up as they came out of the box expecting that I would need to add some creative touches to them to keep our two locksmiths out of them. I was wrong. I set them up a day before we went on a weekend trip and watched the fireworks. The kitties were miffed. Before they had gone through three auto feeders with a rotary wheel that looked like a water wheel. They were able to rebound off of them to dump them, or bend /break off the tangs on the wheel and the buffet was on. No such luck with these. They could not knock them over, could not sneak a kibble. Nothing... When we came back from our trip the feeders had moved around a few inches but they were intact and the kitties were still yowling at me when I came in their room. They do not like me anymore... These feeders were worth every penny. Thank you for going the extra mile to get them to me in time for our trip. P.S. I suspect you may get some hate mail from the kitties before too long. 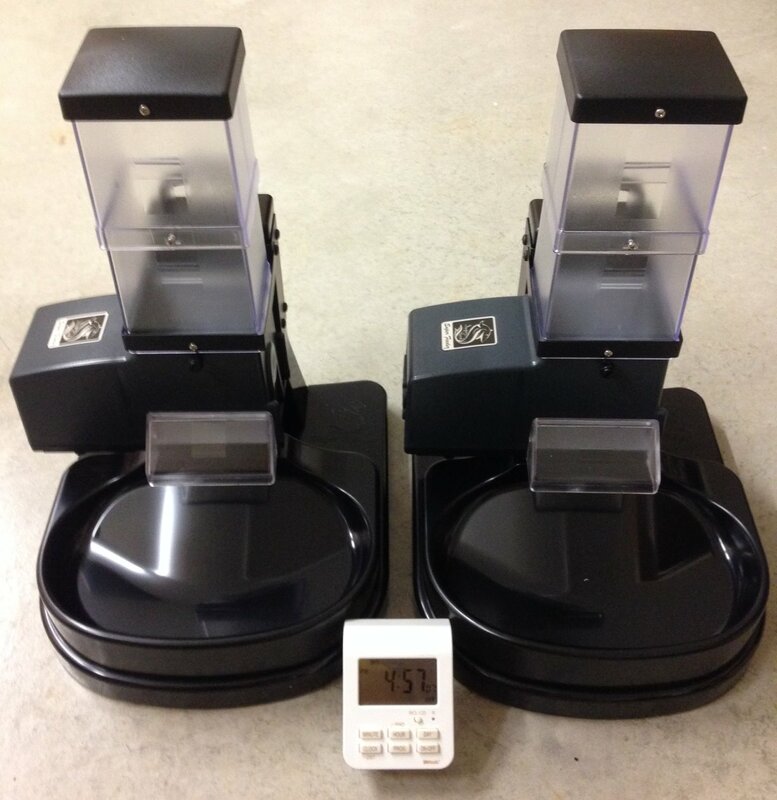 Did a great deal of research on the majority of automated cat feeders on the market and after speaking to a company representative via their customer service 800 number, I decided to purchase Deal-24 -- CFS Double Super Feeder Combo with Chute Covers, 1 ACDT-36 Dual Outlet Digital Timer, Stands and Bowls, plus I also order 2- 1.5 Hoppers. This product is awesome and operates as advertised. Very satisfied with the quality and operation of the products. The unit is worth the financial investment. My 2 cats took to it immediately. The cats now have their own personal food butler! When the timer automatically turns on the units, it's like a dinner bell going off for them. It is the only product I know of that lets you control the exact amount of dry cat food to be dispensed. Did I mention that the units are awesome!!! Looked at cheaper alternatives but was worried the cats could get into it or it wouldn't trigger reliably. I've got two cats and one is more aggressive about eating so it was important that I get a set up where both feeders would trigger at EXACTLY the same time. This timer based system works beautifully and after getting the cycle time dialed in it's been in daily use for about a month now. Bowls are easy to remove and wash and I haven't had any issues with the cats getting into the hopper. It's not nearly the cheapest option out there for auto feeders but I guess you do pay for quality. Thanks! After several weeks of searching for 2 feeders that would work off of one timer, I finally decided to buy these. The cost was more than I wanted to pay but the product has proven to be worth every penny. It was fairly simple to assemble and program. My cats figured it out quickly. My older cat used a different feeder when she was our only cat. She was able to steal kibble easily. As soon as I put this feeder on the floor, she immediately tried to reach into it. The chute effectively prevents any stealing. The younger cat has figured out how to pop off the lids so I have to duct tape them onto the unit. I no longer get woken up at for early morning feedings. They eat, we sleep in, and everyone is happy. When we go away for 3 day weekends, we don't need a sitter. We put out an extra water bowl and litter box and they are set. The money spent on the feeder is saved in pet sitting cost and is priceless for our sleep schedule. We've had them for a few months and they're good products but if you want to be accurate in dispensing food, you'll need to hack it with a scale. Purchased 2 Superfeeders for my 2 cats. One is a locksmith and I can say that he hasn't succeeded in attaining the food and it's not as if he hasn't tried. He's can't wait for us to get up at 5:30 he wants to eat earlier. We're now able to sleep until the alarm goes off. We can now go camping for the weekends without having someone coming over every day for the cats. So it's freedom for everyone. Very easy to adjust and the quantity is very close 9 times out of 10. Overall this looks like a quality product that will work for years to come. I am using the Science Diet kibbles as is recommended. It will not give out a consistent amount of kibbles though. I spent A LOT of time adjusting the timer and the opening of the door on the chute. I weigh the food for my cats and it could vary from 12 to 29 grams. I finally found a setting that is was comfortable with and left it at that. I only use the feeders when I leave for the weekend or go on vacation. So, it is not a huge deal for me, they are getting fed. If you are trying to put a cat on a diet and want very precise amounts of kibbles, then I am not so sure this is a good choice. I had feeders that were a tray and the lid moved to feed the cats. This of course you measure ahead of time so it is always right on. My old feeders did not work anymore since my new cat would just flip the lid off and all of the food was gone right away. If you have a cat that figures out how to get into food. The Super-Feeders will work perfect. I will say that there is some chance of them 'hitting/pawing' at the feeder and some kibbles can fall out. The base is wide and stable though. You can minimize this by setting the door chute a little tighter. Of course the feeder can always be mounted to a 2x4 and secured to the wall. Again, these seem to be excellent feeders that should be the last I will every need to purchase. I am very happy that I got them. Thanks for giving us our sleep back! We were constantly being woken by our very bad, very hungry cat at progressively earlier hours overnight. We bought a SuperFeeder combo to feed both cats, and they've taken to it very quickly! It was fairly easy to assemble, and the components look solid. We're looking forward to a lot of restful nights! Can't say enough good things about these feeders! We have four cats, one with IBD who really needs her meals to be small and spread throughout the day. AND we were getting tired (literally) of the time at which the cats seemed to think they needed to be fed. Much research led me to the Super Feeder, and I'm glad it did! We started out with two on one timer for the cat with IBD and her companion. They are fed four times a day, every six hours. Taking care of those two took care of our early rising as the other two cats are a little less insistent. I've ordered two more feeders for the two cats that live in the front part of the house. They don't have the dietary needs of the IBD cat, and they share their space with the dogs, so their feeders will be used only when we are away for the occasional weekend out and for longer vacations. I love the fact that when vacation time comes I'll be able to have the cat sitter come out once a day or every other day to make sure all is well and clean the kitty boxes instead of the twice a day visits we have had. Even the twice a day visits were hard on the IBD cat because she really does much better with regular feeding times. Setting them up is a little fiddly, but it isn't difficult and once set they perform flawlessly. These feeders are well worth the price! It truly is the best invention.. Works amazing, both my cats get excited when the food drops..really saves me the morning aggravation of getting up and the evening of rushing home.. Easy to assembly if you watch the video, although the timer is a bit tricky. But I love it!!! We tested these feeders several days before leaving on a weekend getaway. They performed as advertised. We only use them when we leave because we want to keep a "relationship" with the kitties while we are at home. The feeders performed flawlessly. I do wish you had an option of only getting the manual set timers. The programmable one is a pain. We would much rather have the manual ones. That should be an option when ordering. The feeders measure food very accurately after you tweak them with the provided screwdriver. Very satisfied with the service. I purchased two feeders with a single timer and everything is working like a charm. I couldn't be happier. I'm frequently away so it was important my cats had reliable feeders. I had another type but the pellets kept getting stuck and the food wouldn't dispense properly. My cats would then get frustrated and simply tip over the feeder and spill out all the food. Now, just the right amount is dispensed EVERY single time. Didn't understand the timer at first and Gerard helped me. He was great. I highly recommend this to anyone who needs a reliable feeder. Easy set up, easy programming and works as promised. I tried a couple of other of feeders for our cats but we have a locksmith cat here and the others simply failed. We'd come home to a beach-ball cat and a hungry cat. This was just not healthy for our guys so I continued searching. This one seemed expensive, but they said it was locksmith-proof. Simply put it is locksmith proof and beautifully built with high quality craftsmanship. I also highly value made in the USA and supporting small family run or employee owned businesses. I am so pleased to have been able to have found a feeder that meets all my requirements. This thing will last forever so if you are on the fence because of the cost, don't worry. There products are of the highest quality.